I recently reviewed a number of current releases from this newer Sonoma Coast winery (Volume 8, Issue 7, www.princeofpinot.com/article/810/). Here are some additional bottled wines I recently reviewed and some impressions from several 2008 barrel samples. I continue to be very impressed by the consistent quality of the Freestone Vineyards wines. Admirably, the winery has lowered their prices in response to the economic conditions. 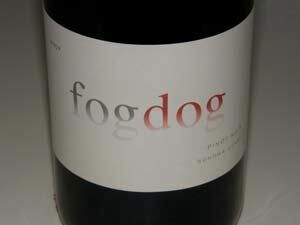 The Fogdog wines represent the entry level, value-priced wines in the portfolio but they are very good wines in their own right. A fogdog is a bright or clear spot that appears in breaking fog and is often observed in the Freestone area. The estate Chardonnay clones include 2A (Wente), Mt Eden, 548, Dijon 76 and suitcase selections. Pinot Noir plantings include Dijon clones 115, 777 and 828, and heritage selections. The Calera selection of Pinot Noir really shines in the Freestone plantings. 13.5% alc., $35. Sourced from Dutton Ranch Mill Station and Sullivan vineyards. Aged 15 months in 60% new and 40% two to three-year-old French oak barrels. · Demure aromas of lemon meringue tart and white stone fruits. Bright and crisp on the palate featuring flavors of peaches, lemon curd and grapefruit with the faintest oak. The fruit gives a delicate impression of sweetness. Good. 14.0% alc., $45. A mix of estate vineyard fruit (61%), Dutton Ranch (21%) and Bacigalupi (18%). Aged 15 months in 60% new and 40% two to three-year-old French oak barrels. The lees are stirred frequently during primary fermentation (once a week) but not during secondary fermentation. Meant to be a rich, full-bodied California styled Chardonnay. · Light golden yellow in color in the glass. Delicate but pleasing scents of lemon curd, pear, white peach, tropical fruits, and steely minerality. Delicious core of citrus and pear flavors with a hint of caramel and baking spice all underlain with a crushed rock minerality. A citrus tang lifts the bright finish. A highly nuanced wine that aims to please. Very good. 13.5% alc., $35. 100% estate grown. A mixture of several Dijon clones and several heirloom selections. Aged 15 months in 40% new and 60% two to three-yearold French oak barrels. Slow fermentation with 20% whole clusters. · Dark and dense reddish-purple color in the glass. Lovely aromas of intensely perfumed wild berries, raspberries, and plums with a hint of exotic spice box and oak. Remarkably rich for an entry level wine flaunting a flavor palate of macerated berries, plum and pomegranate. Restrained, slightly grainy tannins and a zippy, refreshing finish that features citrus peel and dried berries. A good food wine with the right mix of intensity and delicate balance. Very good. 13.5% alc., $55. 100% estate grown fruit. Aged 15 months in 65% new and 35% two and three-year-old French oak barrels. 43% whole cluster. · Nuanced aromatics featuring scents of berry tart, sandalwood, and barnyard. Spicy, tenacious palate of wild berries and plump cherries set off by notes of savory herbs and sweet oak. Rich and generous, yet offering style and grace. Just when you are content, it wows you some more with a memorable spice box finish. Very good (+). Barrel sample. · A solid wine with discreet richness and appealing flavors of pear and citrus backed by bright acidity. Barrel sample. Composed of best barrels in the cellar. · A step up in complexity and expression. Pleasing mineraility. Amazing aromatic persistence on the generous finish. Barrel sample. From a single 500L oak puncheon. · Strikingly nuanced with aromas of yellow stone fruits, spice and petrol. Rich and mouth filling white peaches, tropical fruits and citrus combine with subtle oak highlights to produce a beautifully composed wine that will be special when bottled. 13.5% alc.. Barrel sample. · Wow! The aromatics really pop with scents of wild berries and cherry tart replete with baking spices. Rich and ripe, fruit-forward and attacking. 13.26% alc.. 100% whole cluster fermented in an oak open-top fermenter. · Hi-tone aromas of well-spiced red fruits. The layered fruits are vivid and juicy accented by notes of earthiness and savoriness. Despite the whole cluster fermentation, no sign of a green edge. Still has tannins to shed. The acidity is bright. More forward than the 2007 vintage. 14.0% alc.. 100% whole cluster fermented. Calera and 828 clones. · Deep, dark color. Flush with dark stone fruits and dark chocolate on the nose and palate with more extraction, ripeness and tannin than the Quarter Moon bottling or the 2007 bottling of this wine. Visit the winery website at www.freestonevineyards.com to acquire. The winery’s guest center in Freestone is open on weekends. Significant discounts are offered to wine club members. I tasted through barrel samples of Paul’s 2008 Pinot Noirs which were in tank scheduled to be bottled in the following day or two. After Paul speaks so eloquently about each wine and gushes with fatherly pride, it is difficult not to like the wine. You feel like hugging him, hugging the tank, jumping up and down, and whooping it up. Paul says the 2008 wines are the best he has made to date (I know, you always hear this from winemakers, but I will pass it on anyway). He likens the 2008 wines to Julia Roberts: charming but plenty of structure in the right places. The 2008 vintage wines will be released at the end of February and include a Chardonnay and four vineyard designated Pinot Noirs from Fiddlestix, Gold Coast, Pisoni, and Solomon Hills vineyards. 2008 is the first year for a Paul Lato Pisoni Vineyard Pinot Noir. Paul is sourcing from a small parcel from a 25-year-old block that Gary Pisoni has always kept for his own Pisoni Estate Pinot Noir. These wines were also sampled out of barrel in May 2009 after the World of Pinot Noir event in Shell Beach, California (www.princeofpinot.com/winery/446/). 150 cases, $50. Barrel sample. Sourced from the Sierra Madre Vineyard in Santa Maria Valley. 11 year-old Wente clone vines. 70% new oak, 100% MLF, aged sur-lie, native yeast fermented, only first pressing, lightly filtered. · Attractive scent of lemons and roasted nuts. Delicious flavors of citrus and creme brulee with the faintest hint of oak. Think Aubert Chardonnay brought down a notch. Very good (+). 100 cases, $60. Barrel sample. Aged in 50% new French oak barrels. Martini clone, 14 year-old vines. · Light in intensity and highly aromatic in the fashion of a Chambolle Musigny. Dark fruits, underlying earthiness and edible flower. Well structured to last. Down the road will become even more savory. Very good. 75 cases, $35. Barrel sample. This is Paul’s first attempt at a blended wine using barrels from Solomon Hills, Pisoni and Gold Coast vineyards that didn’t fit the vision for the single vineyard bottlings. Inexpensively priced as a thank you to customers and possibly a good fit for restaurant by-the-glass programs. · A simple, delicately composed wine featuring dark Pinot fruits with a healthy tannic backbone and a somewhat shallow finish. A perfect daily drinker. Decent. $65. Barrel sample. Clones 115, 667 and 777. · Appealing scents of spiced dark fruits and wet leaves. Moderately rich essence of blue and black fruits with a spicy, earthy underpinning. Impressive persistence on the generous finish. The tannins are well proportioned. Still very young but superb potential. Very good (+). $70. Barrel sample. Clones 115, 667, 777. · Moderately dark reddish-purple color. More tannic, loamy and savory than the other wines in the lineup. The well-hung core of dark fruit is brooding which is not surprising as this wine is typically slow to evolve. Big but not at all jammy. Develops increasing charm with time in the glass. Very good (+). 75 cases, $75. 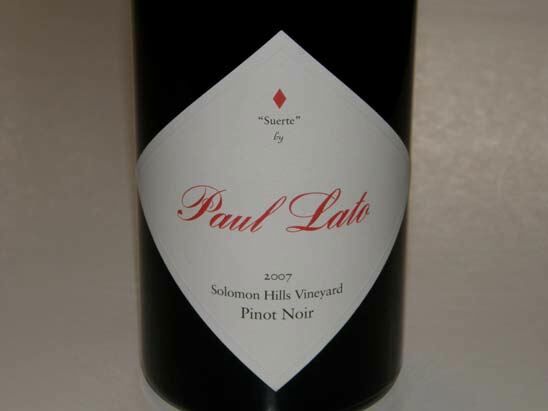 · Paul tried to invoke his trademark elegance with this wine but it is still BIG. It is stacked and packed with blackberries, black raspberries, black plums, and cola, with a woodsy, toasty and grilled meat character. It is a formidable wine that lacks charm and is not open for business at present. Judgment is out on this one until the wine mellows some through bottle aging. Pisoni unplugged. Paul Lato wines are sold through a mailing list at www.paullatowines.com. Since production is so limited, public tastings are not offered except at certain events such as the World of Pinot Noir. Though born into a farming family, Gary Burk’s first love was music. After earning his business degree from Cal Poly at San Luis Obispo, he moved to Los Angeles to pursue a career as a musician. During his time in Los Angles, Gary’s father Ron Burk partnered with Bob Espinola and planted the 30-acre Gold Coast Vineyard located six miles east of Santa Maria on Foxen Canyon Road. This sparked an interest in grape growing in Gary and he began selling Gold Coast grapes to winemakers from his Los Angeles base. In 1993 on a visit home to Santa Maria, Gary shared a dinner with Au Bon Climat’s Jim Clendenen and Dominique Lafon of Domaine des Comtes Lafon in Burgundy. After that evening, Gary was hooked. Amazing what a great glass of Meursault will do! In 1994 he was invited to work harvest at the Au Bon Climat/Qupe facility and was hired full time in 1995. He left in 2002 to devote all of his energies to Costa De Oro. Burk crafted one barrel each of Gold Coast Vineyard Chardonnay and Pinot Noir in 1994, and slowly increased production each year under the Costa De Oro label to the current level of 4,500 cases annually. He currently produces his wines at the Central Coast Wine Services facility in Santa Maria where Paul Lato lends a hand. I tasted three barrel samples of 2008 Costa De Oro Pinot Noirs that are scheduled for release in the summer of 2010. These are unique wines sourced from the Martini clone, a traditional California clone that is widely planted in the Gold Coast Vineyard along with more recent plantings of Dijon clones 115 and 667 in the same vineyard. The Martini clone typically exhibits an underbrush and floral aroma and flavor along with the earthiness, spice and brininess common in Santa Maria Valley Pinot Noirs. $32. Barrel sample. Primarily Martini clone. Grapes were de-stemmed, cold soaked for 3-6 days, inoculated with Assmanshausen yeast, manual punch downs, pressed to barrel at dryness and aged in 25% new Francois Freres French oak barrels for 14 months. Lightly egg-white fined, unfiltered. · Bright purple fruit with accents of spice box, clove and earth. Substantial tannins with impressive persistence on the pleasing finish. Good. $50. Barrel sample. A barrel selection with extended barrel aging and more new oak. 75% Martini clone, 25% Dijon clones 115 and 667. · Aromas and flavors of wild blackberries and black raspberries with notes of white pepper, spice and loamy underbrush. Delicious and persistent in the mouth with caressing grainy tannins. A special wine deserving of the reserve designation. Very good. Strikingly aromatic and fruity. Very smoothly textured with soft, supple tannins. Very good. The Costa De Oro wines are available online (www.cdowinery.com), through limited retail distribution, and in the tasting room located astride Highway 101 in Santa Maria (open daily). Deborah Hall and her husband, William, bought a 290-acre property in the Santa Rita Hills in 1994 as a retirement ranch with the goal of farming and producing Pinot Noir. Unfortunately, William passed away before they could enjoy their property and in 1997, Deborah sold 160 acres, keeping 130 acres to herself. The 6-acre Gypsy Canyon Santa Rita Creek Vineyard is planted to 4 acres of clones 115 and 777 of Pinot Noir and 2 acres of Pinot Gris (she co-ferments the Pinot Noir with Pinot Gris). Farming has been a challenge, and in 2007, her entire first crop was devastated by deer. She harvested the second crop and sold it off as bulk wine. The site has an exceptionally cool microclimate compared to other vineyard sites in the Sta. Rita Hills appellation. Farming is largely by hand and both organic and biodynamic. Additional plantings of Pinot Noir are planned. The first commercial release of Pinot Noir was in 2004. She has had two bottlings of Pinot Noir: a fall release of Santa Rita Creek Vineyard Estate Pinot Noir and a spring release of Lot 2 Santa Rita Creek Vineyard Estate. A second wine, Angelica, is a dessert wine fashioned from 10 acres (1,000 vines) of very low yielding Mission grapes at the Gypsy Canyon Dona Marcelina Vineyard, which is the oldest producing vineyard in Santa Barbara County. Mission grapes originated in Spain and were first planted by the Franciscan padres as they established the chain of California missions. Today, there are less than 700 acres of the Mission grape left in California and most of these plantings are curiously located in the Gold Country of California, far removed from the coastal chain of missions. The Mission grape does not produce a fine still wine because of high tannins and low acidity. The biggest challenge Hall faces is getting the Mission grapes to ripen adequately. Future plans call for grafting some of the Mission vines over to Pinot Noir which should prove to be an interesting experiment. The Gypsy Canyon wine packaging shows a nod to early California history and is quite unique. Deborah uses hand blown glass bottles of historically correct shape with an embossed glass seal, a handmade paper label, and a beeswax seal. Each bottle is numbered and signed by Deborah. The magnums are particularly impressive adding significant appeal to the wine inside. I recently caught up with Deborah at Central Coast Wine Services in Santa Maria where she crafts her wines. I tasted her 2008 spring release Pinot Noir from barrels. Named “Trois,” production consists of three barrels of of purchased grapes from an unnamed but prestigious Sta. Rita Hills vineyard and 3 barrels from the estate Santa Rita Creek Vineyard. The finished wine will be a 50/50 blend of the two lots. 150 cases, $95, some magnums. I tasted barrel samples from a neutral oak barrel, a two-year-old oak barrel, and a new barrel. The two-year-old barrel really stood out. · Very aromatic with lifting notes of cherries, berries and spice, leading to a discreetly concentrated core of black cherry fruit offering impressive finesse and drinkability. Impressive potential. 17% alc., 9% residual sugar, 50 cases, $130 (375 ml). 7th bottling of this wine. A blend of one barrel each from the 2005 and 2006 vintages. 130-year-old vines. Raised two years in neutral barrels during which time the color changes from a rose to an amber shade. · A highly unique and immensely pleasing sipping wine offering flavors of root beer, caramel and nuts. Very smooth on the palate and leaving more of a dry than sweet impression on the finish. A perfect accompaniment to five-year aged gouda cheese. 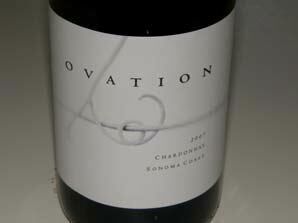 This is one of the most distinctive and limited meritorious wines produced in California today. Very good (+). 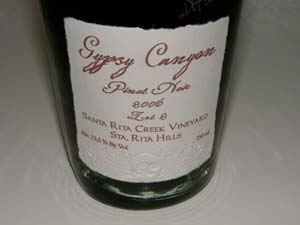 I recently sampled the two Gypsy Canyon Pinot Noirs from the 2006 vintage. These wines are already taking on secondary aromas and flavors. They will appeal to connoisseurs looking for a unique drinking experience. 13.5% alc., $75. · Moderate garnet color in the glass. Initially the nose offers delicate red fruits, savory herbs, oak and hay progressing over time to notes of dried fruits, green tea and dark chocolate. Ripe fruit flavors with accents of chocolate, green tea and finishing dry with a hint of citrus peel. Mediumweighted with admirable elegance and balance. Good. 13.5% alc., $75. · Moderate garnet color in the glass. Aromas of roasted stone fruits, smoke and pork belly. Ripe flavors of currants, marzipan and root beer. Silky textured with welcoming finesse and a dry, aromatic finish. Good. Production is quite limited and sold through a mailing list at www.gypsycanyon.com. Tasting with appropriate cheeses is offered in a historic barn on the property ($25). 805-737-0204. Kenneth Volk is a long time veteran of Central Coast winemaking. He started Wild Horse Vineyards in 1981, eventually planting 33 acres in Templeton in San Luis Obispo County and building a winery in 1983. The same year he crafted a Pinot Noir from Sierra Madre Vineyard in the Santa Maria Valley that brought early notoriety and success to Wild Horse. The winery eventually reached an annual production of 150,000 cases. In 2003, Volk sold Wild Horse Winery for $48 million to Peak Wines International who later sold it to Constellation Brands. In 2004, Volk bought the Byron Winery building on Tepusquet Road in Santa Maria after Byron had moved to another facility and launched his eponymous winery, Kenneth Volk Vineyards. He now produces multiple Pinot Noirs, both appellation blends and vineyard-designates primarily from various vineyard sources in the Santa Maria Valley. The following wines were tasted from bottle with Kenneth Volk at his winery in February 2010. The 2007 wines are to be featured at the World of Pinot Noir in March and released the same month. The single-vineyard Pinot Noirs are sold in 6-packs. 15.8% alc.. Sourced from the Gallo Ranch located on Highway 1, the coldest site in San Luis Opispo County and very late to ripen. Several clones including 2A, 667 and 777. · Aromas of dark purple fruit and oak toast. Intense and Syrah-like blackberry and black raspberry essence with fine-grain tannins. The alcohol is well integrated. A showy, sappy wine that will find fans despite the heat it packs. Decent. 14.4% alc.. · Shy cherry and berry aromas and flavors. Smooth and harmonious with supporting touch of oak and earthiness. The tannins are reigned in and the wine is quite drinkable now. Good. 14.4% alc.. Clones 2A and Pommard. · Expressive and charming nose of fresh cherries and strawberries. Fruit flavors tend toward the redder spectrum. Lighter-styled and enticing. Very good. 14.4% alc.. · Lovely scents of red fruits, roses and spice box which carry over in the flavor profile. Loaded with charm, the fruit is vivid and focused. The finish has remarkable persistence. Very good. 14.2% alc.. Primarily clone 777. · The nose is quite savory with scents of soy and oak. Pleasing core of berry and plum fruit encased in soft, dry tannins. Good. 14.4% alc.. Clones 2A, Pommard, 23. · Deeply colored. Plenty of hi-tone blackberry and black cherry fruit on the nose. A muscular wine with thick dark fruit, almost inky in style. Plenty of tannin to shed. For fans of big-boned Pinot. Good. The Kenneth Volk Vineyards tasting room is open Friday through Sunday at 5239 Tepusquet Road in Santa Maria. The wines are also sold through an online store at www.volkwines.com. 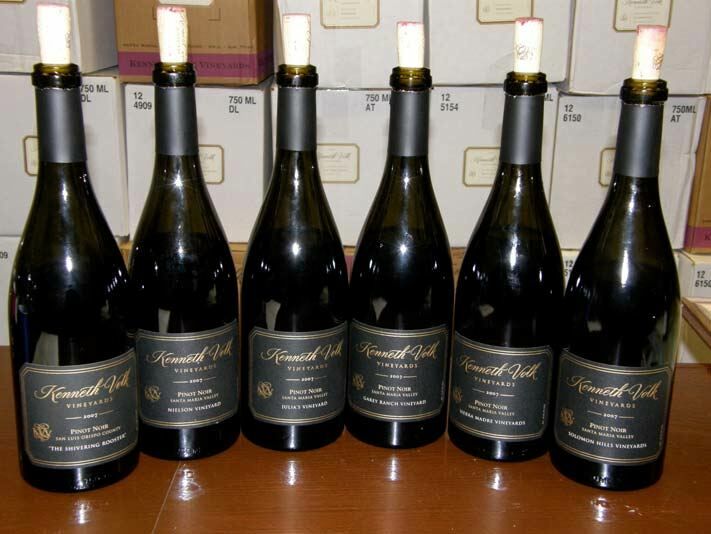 The 2007 Pinot Noirs reviewed above will be priced in the $48 range when released. Volk produces a number of other varietal wines, including a superb Chardonnay. A value-priced Pinot Noir from Santa Barbara County is released under the Aqua Pumpkin label ($18). 805-938-7896. 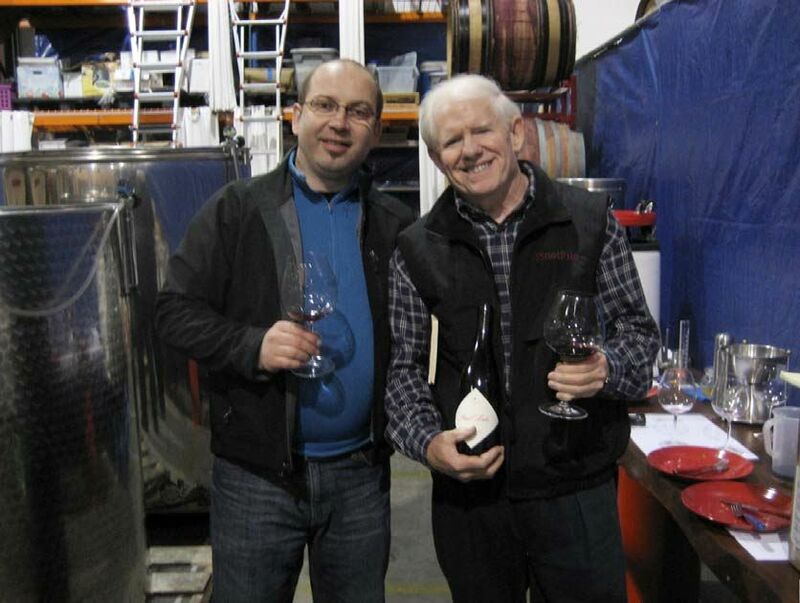 Ambullneo is the passion of winemaker Greg Linn. Greg is a dog lover as well as wine aficionado and the name of his winery reflects that. Ambullneo stands for AMerican BULL Breeds and NEOpolitan Mastiff. Greg is fanatical about quality and spares no expense in achieving his goals. A Burgundy lover at heart, Greg looks to Burgundy for inspiration, but his wines are impressive expressions of California Pinot Noir. Greg started out making only blended wines under the Ambullneo label, believing that a blend of multiple vineyards provided more complexity in the finished wines. Ambullneo always will be a “cuvée house.” He also recognizes the value of expressing the special terroir of unique blocks of fruit he has been able to source from some of California’s most notable vineyards, so he started a vineyard designate wine program under the Greg Linn Wines label. These are wines of place. A third label, Zito Family, offers interesting varietal wines that are more reasonable priced. Greg is not a bashful guy and his first releases were “big-babe” Pinots. In recent years he has fine-tuned his style, picking earlier resulting in lower alcohols, and the wines have taken on more sophistication more akin to the Burgundies that he holds in such high regard. The wines are still packed with flavor and he likes to say that his wines, “Ain’t your grandma’s Pinots.” He is a proponent of whole cluster fermentation and his Pinot Noirs have up to 100% stem inclusion. He believes this adds aroma and flavor nuances and provides the tannin structure for long term aging. The result is that the wines are not easily approachable when released, needing a few years for tannin integration to reach the optimum heights of enjoyability. He also ages his wines longer than most producers, up to two years in barrel is not unusual. Greg is currently crafting his wines in Lompoc. He is not a believer in pouring his wines at crowded festivals where very little serious tasting of wines occurs. He prefers to offer more intimate and focused tastings which he offers in his home in the Central Coast by appointment and through small gatherings. I attended a tasting of fourteen of Greg’s wines, both Chardonnay and Pinot Noir, primarily from the 2007 vintage, in March at the Pacific Club in Newport Beach, California. This was an intimate affair attended by twenty-five wine enthusiasts as well as Master Sommelier, Rene Chazottes, who offered much salient commentary. Each wine was sourced from Dijon clones. Several of the single-vineyard Pinot Noirs are 100% whole cluster fermented. (see discussion of whole cluster in this issue). Alcohols were all under 14% except the Syrah (14.3%), ranging from 12.8% to 13.6%. The wines are aged in anywhere from 50% to 100% new French oak barrels. The barrels are all three year air dried from four top coopers. The Pinot Noirs offered at the tasting were impressively endowed wines that were still tight and showing tannins in abundance (the wines were tank samples recently sulfured and scheduled to be bottled soon except for the 2008 Pinot Noirs which are still in barrel). The impressive breeding of the fruit sources was clear, however, and these are serious wines that will appeal to the Pinot Noir connoisseur, especially those who enjoy the aromas and flavors offered with whole cluster fermentation. Only native yeast and native malolactic fermentations are employed and the wines are unfined and unfiltered. The Chardonnays are sourced from various Santa Maria Valley vineyards and all display bright acidity making them perfect accompaniments to food. My tasting notes are brief as the time spent with each wine was of necessity limited. I plan to revisit these wines after 3 to 6 months in bottle. The aromatics had noticeably improved over the course of the three hour evening tasting. 125 cases, $39. Styled in the image of Didier Dagueneau wines, an iconoclastic Loire Valley winemaker. Raised in oak, 50% MLF. · Bright, juicy and layered pear and citrus flavors, with a discreet richness and backbone ending with a refreshing hi-strung finish. Very good. 200 cases, $49. Crafted in 100% stainless steel. · A big, Chablis-styled Chardonnay with brioche and crushed rock on the nose, and crisp flavors of lemon curd and white stone fruits. Hi-tone acidity. Will give any 1er Cru Chablis a run for its money. Good. Pair with veal, cream sauces. 250 cases, $49. Aged in 25% new French oak barrels. 100% barrel fermented. · Moderately rich with lovely flavors of white peaches, pear and honey with a supporting note of oak. Very good (+). Pair with white fish. 250 cases, $49. Grangerville is the original name of Santa Maria. Aged in 100% new French oak barrels. · The richest Chardonnay in the lineup with the oak offering caramel and spice accents to the flavors of white stone fruits and creme brulee. Finishes with a refreshing grip of lime peel. Good. Pair with fish with lemon. 400 cases, $69. A cuvée from several vineyard sources and the Ambullneo flagship wine. 100% whole cluster. · Pretty core of berry, cherry and plum fruit with a faint spice box and herbal edge. Restrained tannins and bright acidity. Good. 250 cases. 25% whole cluster. · More forward than the 2007 vintage taking on more charm with time in the glass. Plentiful juicy berry and cherry flavors with a touch of spice and pine pitch. Harmonious tannic backbone. Very good. 100 cases. 100% whole cluster. · Deep, dark color. Very tight but offers hints of greatness. Layers of dark fruits are evident highlighted by notes of Asian plum sauce and black currants. A hint of green tomatoes surfaces on the nose. Showing daunting tannins that will need time to resolve. Good now but will want to revisit in a couple of years when the wine is more open for business. 100 cases. 100% whole cluster. Clones 115 and 667 planted on their own roots. Greg is the only producer from this site (a “monopole”). · Knock out nose featured macerated wild berries with a hint of spice, herbs and soy. Delicious cherry and berry core wrapped in healthy ripe tannins. Has an appealing exotic riff to the flavorful fruits. Very good (+). 60 cases. 100% whole cluster. · Tight aromas of dark fruits, cut flowers and green beans. Chunky and immature, with substantial tannins. The fruit core is delicious and the smooth texture is heavenly. Good. 300 cases. 100% whole cluster. · A big, intense and concentrated wine which is packed and stacked with beautiful black cherry and blackberry fruit. An earthiness adds interest and noticeable oak offers secondary accents. Still flaunting flamboyant tannins. Very good. 150 cases. 100% whole cluster. · A fruit-driven attention-getter with a luscious core of perfectly ripe cherry and berry fruit. Plenty of hi-class booty here. The moderately husky tannins are fine-grained and the finish is lengthy and generous. Very good (+). $69. Aged three years in barrel. 25% whole cluster. · Pleasing aromas of dark berries, plum sauce, white pepper and smoky oak. The purple fruits are discreetly concentrated and wrapped in soft, dry tannins. More restrained than many California Syrahs and one that will appeal to Pinot drinkers. Very good. 13.2% alc., $49. · A shy nose leads to a delicious fruity core of purple fruits with hints of peppery spices. Uncommonly light on its feet for a California Zinfandel, and easy to drink. Good. All the 2007 wines and the 2008 Zinfandel were in release by March 5, 2010. Prices are between $69 and $95 for the Pinot Noirs and $49 to $75 for the Chardonnays. 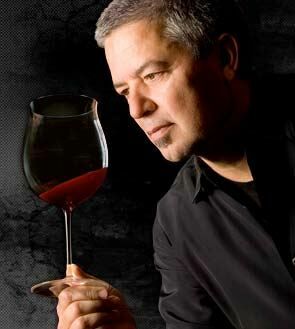 As mentioned above, Greg offers tastings in his home by appointment (805-474-5678). Greg is a no-nonsense, frank, but colorful winemaker and you will feel very comfortable and even entertained while tasting with him. I often say that a winery’s wines reflect the personality of the winemaker, and in the case of Greg and his wines, this is very true. 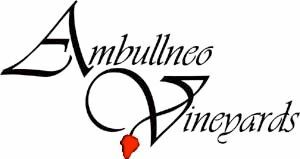 The website is www.ambullneovineyards.com.